Scotch thistle is a tap-rooted, biennial plant that can grow to 12 feet tall. It reproduces by seeds. During the first year rosette leaves can grow to 2 feet long and 1 foot wide. They are densely covered with fine white hair giving them a blue-grey color. The edges of the leaves are very wavy, lobed, and tipped with sharp spines. A thick, upright stem is produced the second year. Stem leaves are deeply lobed, spiny, and alternate. The leaf blades extend along the stem as wing-like projections. The entire plant is covered with fine, dense hairs giving it a wooly appearance. Each branch of the stem produces two to three large flowerheads about 2 inches in diameter. Flowers are bright reddish-purple in color. The seeds are smooth, spatula-shaped, and tipped with a plume of soft bristles. Grazing Objective: Prevention of flowering and reduction of stem density. Growth Stage for Treatment: Graze Scotch thistle at the rosette to bolting stage. Livestock will graze Scotch thistle with some reluctance, and better results can be achieved after they have some experience with the plant. Heavy to severe utilization, using short-duration, high-intensity grazing practices, provides the best results when repeated for several years to deplete the seed bank. Potential Effectiveness: Prescribed grazing of Scotch thistle is considered an effective means of control, suppressing flowering and reducing stem density 30 to 50%. 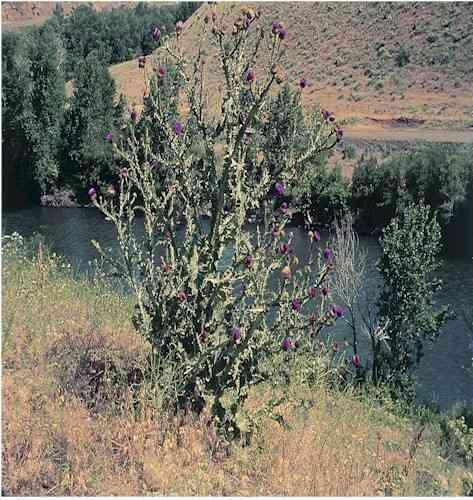 Sheep, goat, and cattle grazing is considered effective, although several years of grazing may be needed to reduce populations of Scotch thistle. Maintaining vigorous perennial grass competition is essential to long-term management. Grazing Scotch thistle is very effective when combined with a follow-up herbicide treatment. Holst, P.J., C. J. Allan, M.H. Campbell, and A.R. Gilmour. 2004. Grazing of pasture weeds by goats and sheep. 1. Nodding thistle (Carduus nutans). Australian Journal of Experimental Agriculture 44:547-551.